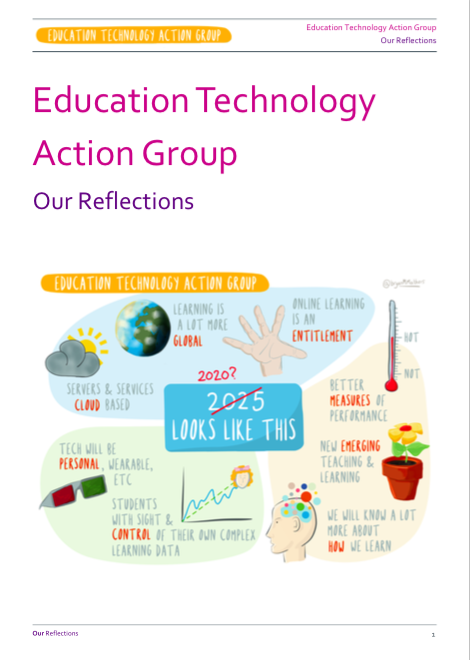 At the beginning of 2014 a Ministerial team from DfE and BIS asked a newly formed Education Technology Action Group (ETAG) how digital technology might empower teachers and learners by enabling innovation using the new smart technologies around us. Their intention was to see how that empowering could deepen and accelerate learning – and by the way they added, “it needs to be fun”. That was, of course, a hugely seductive brief and I was delighted to be asked to chair the group. But it didn’t end there. Ministers also asked if we could guide them towards undoing past policies that had had unintended, and less than helpful, consequences. Further, they asked us to be “ambitious”. Politics moves on, those ministers are now superseded, but our brief continues today, still supported and welcomed. At the outset we didn’t see this as a “committee” to produce “a report” and, although here you will find a number of suggested recommendations from our experienced group, the task is really for everyone reading this to pursue that brief themselves, in schools, colleges, business and company training departments, universities, indeed everywhere. 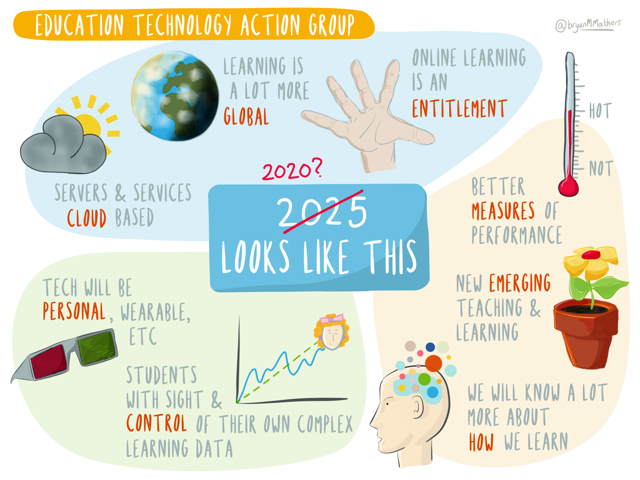 To give our suggestions relevance we wanted a starting point with a clear consensual view of what tomorrow will look like; to be clear where we are going with Learning. We thought that would guide ministers, principals, parents, governing bodies, students, families, companies and everyone. We left out the crazier predictions, but immersed ourselves in white papers, other policy documents worldwide, tech futures briefs and of course our own collective long years of experience. Our gentle conclusions guided our policy suggestions but should serve as a litmus test for anyone reading this and wanting to add their own ideas of “how digital technology might empower teachers and learners”. Why should all this matter? Two reasons: around the world new targets for learning success are emerging that we need to move forward to achieve. One example: the PISA measures of international learning comparison are changing rapidly to recognise the new needs of this complex world. From 2015 PISA assessments will be digital technology-enabled and a new emphasis on collaborative problem solving appears. This heralds even bigger changes for 2018 when Pisa revisits “literacy”, to include such capabilities as “recognising credible websites and online documents”, or “students’ awareness of the interconnected global world we live and work in”. This is clearly not a time to stand still or to simply finesse the past. But secondly, around the world we have some 2.2 billion children. Barely half reach secondary age education. For a very large number of them the education they need to move forward economically, or as parents and citizens, is elusive. 55 million of them, probably a lot more, have no schooling at all. 114 out of 208 countries have a “significant” shortfall of teachers. The world needs nearly 13m more teachers, today. We are a wealthy nation with a uniquely long history of harnessing technology to learning. I believe that there is a moral imperative to think freshly about how learning might be better for all, cheaper, deeper, faster, more relevant and yes, fun too. We won’t impact on that colossal need by simply replicating expensive and often disengaging 20th century Western style schools. We need to think afresh, to step clear of legacy solutions. This ETAG task, with the very welcome and bold brief of our ministers, hopefully will be the beginning of the much fresh thinking still to come from everyone. Our work is indicative, rather than prescriptive. It is for everyone to move forward. The need is clear, and the need is now. Felipe Segovia Chair of Learning Innovation at Universidad Camilo José Cela, Madrid. Chair in New Media Environments, CEMP, Bournemouth University.